We've been busy busy bees lately. While we do tend to have a lot of visitors we decided that the 2% of our total time they spend with us was not worth having a beautiful, large, empty room in the basement. So... we rearranged. Noah has taken residence in his very own room with a queen size bed in what used to be the office. The office is now where the guest room used to be. Everything in the basement has been rearranged and feels much more inviting. I didn't take a completely finished picture, apparently, but you get the idea. The walls shall be painted soon! The office is in a cold place where it belongs (and near where the kids usually are which helps me out). It's inviting and inspiring. Josh and I do our painting and crafting in this room now. Noah has his own space where he can escape the unrequited love of his minions. We still have some painting and decorating to do, but he's already in love with his door (it shuts out brothers) and his new desk. This is the first time in my life that I've lived so close to the beach! We live a short trip down the highway to the Chesapeake Bay and I've found plenty of stops along the way to enjoy. The more public beaches like Calvert Cliffs and Flag Ponds are always great, but sometimes can get a bit crowded for this introvert's taste. 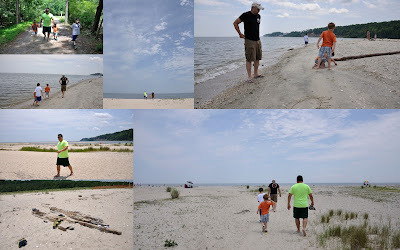 Flag Ponds Nature Park is by far the best beach experience near us. The beach area is so huge it never really feels crowded. The walk to the beach from the parking lot is short. The facilities are well-maintained and conveniently located. There is a little pond that's jellyfish free that the kids can still play in (little boys who enjoy mud and dirt especially love it). We bring all our company out to this beach when they come to visit. In June we've already brought my brother and his family and our friend Rudy, not to mention the few trips we've taken with the neighbors there as well... it's a fabulous place to go.